SOCORRO, NM -- Scientists and engineers at the National Radio Astronomy Observatory (NRAO) have made a giant leap toward the future of radio astronomy by successfully utilizing the Very Large Array (VLA) radio telescope in conjunction with an antenna of the continent-wide Very Long Baseline Array (VLBA) using the longest fiber-optic data link ever demonstrated in radio astronomy. The 65-mile fiber link will allow scientists to use the two National Science Foundation (NSF) facilities together in real time, and is the first step toward expanding the VLA to include eight proposed new radio-telescope antennas throughout New Mexico. LEFT: Miller Goss, NRAO's director of VLA/VLBA Operations, unveils graphic showing success of the Pie Town-VLA fiber link. 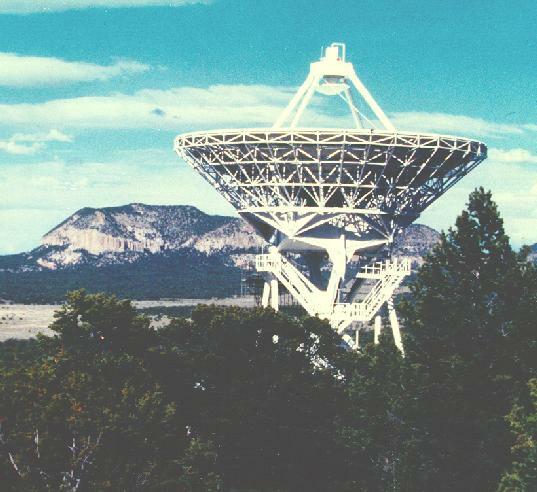 The project, funded by the NSF and Associated Universities, Inc. (AUI), which operates NRAO for the NSF, links the VLA and the VLBA antenna in Pie Town, NM, using a Western New Mexico Telephone Co. fiber-optic cable. The successful hookup was announced at a ceremony that also marked the 10th anniversary of NRAO's Operations Center in Socorro. "Linking the Pie Town antenna to the VLA quadruples the VLA's ability to make detailed images of astronomical objects," said Paul Vanden Bout, NRAO's Director. "This alone makes the link an advance for science, but its greater importance is that it clearly demonstrates the technology for improving the VLA's capabilities even more in the future." "Clearly, the big skies and wide open spaces in New Mexico create near perfect conditions for the incredible astronomical assets located in our state. This new fiber-optic link paves the way for multiplying the already breathtaking scientific capabilities of the VLA," Senator Pete Domenici (R-NM) said. The VLA is a system of 27 radio-telescope antennas distributed over the high desert west of Socorro, NM, in the shape of a giant "Y." Made famous in movies, commercials and numerous published photos, the VLA has been one of the most productive and versatile astronomical observatories in the world since its dedication in 1980. The VLBA is a continent-wide system of 10 radio telescopes distributed across the continental United States, Hawaii and St. Croix in the Caribbean. In both the VLA and VLBA, the cosmic radio waves received by each antenna are combined with those received from every other antenna in the system to produce images with extremely great resolving power, or ability to see fine detail. The more widely separated the antennas, the greater the resolving power. The greatest separation between antennas of the VLA is 20 miles; in the VLBA, 5,000 miles. If your eyes could see the same level of detail as the VLA, you could, at the distance from New York to Los Angeles, make out an object the size of a small car. With the resolving power of the VLBA, you could read the owner's manual. The VLBA can make images hundreds of times more detailed than those available from the Hubble Space Telescope. However, because of the way in which such multi-antenna radio telescopes, called interferometers, work, there is a gap between the levels of detail obtainable with the VLA and the VLBA. Linking the VLA to the VLBA Pie Town antenna is the first step toward filling in that gap and allowing astronomers to see all scales of structure -- small, medium-sized, and large -- in objects such as stars, galaxies and quasars. Additional antennas, distributed throughout New Mexico, would fully fill that gap. Adding the new antennas to the VLA "would provide the capability to image astronomical objects on all spatial scales, from the very largest to the very smallest. 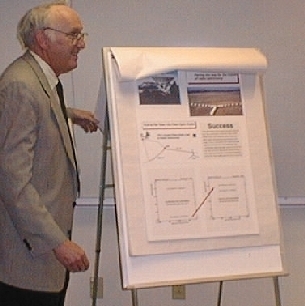 The combination of the VLA and VLBA then would be the only single instrument in astronomy covering such a range of spatial scales, and thus a tool of great and unique value to science," said Vanden Bout. 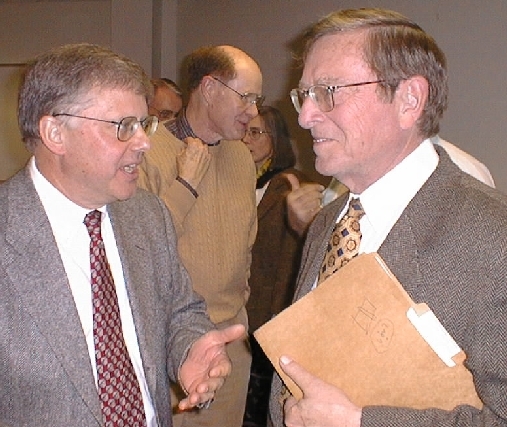 LEFT: NRAO Director Paul Vanden Bout, left, speaks with U.S. Senator Pete Domenici, right, following the ceremony at the Array Operations Center in Socorro Dec. 15. Nobel Laureate Robert Wilson is in the background. The added antennas are part of a comprehensive plan that the NRAO has developed for upgrading the VLA. The existing array of antennas was authorized by Congress in 1972 and built from 1974 to 1980. The upgrade plan also includes replacing the original electronic and digital equipment from the 1970s with modern technology. Such refurbishment will improve the VLA's scientific capabilities from tenfold to a hundredfold in all research areas, and for a modest investment would provide an enhanced facility many times more powerful than the original VLA. "Though the VLA today is hundreds of times more capable than its original design, some of the technologies of the 1970s that still are in use threaten the instrument with premature obsolescence," said Miller Goss, NRAO's director of VLA/VLBA operations. "Replacing those with today's technology will assure the VLA's continued role as one of the world's premier astronomical research facilities. The success of the Pie Town-VLA link shows one way this can happen." "We are enthusiastic and excited about this development, not only because of the scientific value of the Pie Town link itself, but more importantly because it proves the concept of expanding the VLA," said Robert Dickman, of the NSF's Division of Astronomical Sciences. "The AUI Board of Trustees, in providing 30 percent of the support for the optical fiber link from its corporate reserves, recognizes the scientific importance of making this connection between the VLA and the VLBA," said Martha P. Haynes, AUI's Interim President. Referring to the scientific phenomenon of forming images using the arrays to produce "interferometric fringes," Haynes, a radio astronomer herself, remarked that "We view the provision of corporate matching funds for this project as a 'fringe benefit' for NRAO." Work on the Pie Town-VLA link began in late 1997. Project engineer Ron Beresford, who came from the Australia Telescope National Facility to work on the link, said "This is the longest fiber-optic link yet demonstrated in radio astronomy. Radio telescopes in Australia and elsewhere are connected by a few miles of fiber, but the link between Pie Town and the VLA is more than 20 times longer than any other such fiber link." The project involved designing, building and testing specialized electronic equipment to connect both the VLA and the Pie Town antenna to the fiber-optic cable. In addition, both hardware and software at the VLA had to be modified to allow using the Pie Town antenna as an integral part of the VLA. "This was an extremely complex undertaking, and it succeeded because of an outstanding team effort involving scientists, engineers and technicians," Goss said. The VLA and VLBA are facilities of the National Science Foundation, operated under cooperative agreement by Associated Universities, Inc.